Adeliza is an isolated, lonely child, until Lottie rescues her by teaching her a way to communicate. For Adeliza has lost the limited sight and hearing she was born with after an illness, and she has stopped speaking too. Her mother has retreated to her room and Adeliza becomes a frustrated and angry child, even violent. Then Lottie comes along and teaches her finger signing. Adeliza becomes an enthusiastic student, keen to explore the world about her. She starts to write to Lottie’s twin brother Caleb, and later gets to meet him. Rebecca Mascull packs a lot into this historical novel set in Victorian and Edwardian Kent, and later in South Africa during the Boer War between rival groups of white colonists. It is the story of a young woman with disabilities learning to communicate, of various relationships with family and friends, of war and violence. The novel’s title refers to the voices which seem to be present in Liza’s mind, many with sad stories of problems they can’t resolve. 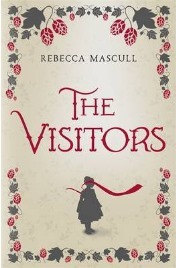 The writing of The Visitors is richly descriptive, as Liza describes the family herb garden and her father’s hop farm. The account of Lottie helping Liza by teaching her hand signing reminded me a lot of the story of the American deaf-blind girl Helen Keller and her teacher Annie Sullivan, but then it takes on a direction of its own. This part of the story is told mainly through a series of letters from Caleb to his sister Lottie and friend Liza. The Boer War is far less often featured in English historical fiction than the World War 1, perhaps because a lot of the history reflects rather badly on the British, as white colonists established the exploitation of black Africans in agriculture, mining and industry for their own profit. The British at this time are also credited with the invention of concentration camps, where Boers were sent and appallingly treated. Caleb at first believes his side are trying to help women and children whose men they have killed in the war – it takes him some time to grasp what he is being told by Boer widow Maria. I was a bit uneasy with some aspects of this story – black Africans are really only mentioned in passing. But I also found it quite a page-turner. I wasn’t sure about the central concept of the Visitors as I couldn’t quite suspend my disbelief but they do turn out to be crucial to the plot. So, I would have to say some bits of this story worked out better for me than others, but I do look forward to reading Rebecca Maskull’s next published novel. No Comments on "The Visitors"